Surrounded by natural beauty, this little gem of a town has always been considered a real treasure, and in fact was gifted many times over the centuries to those who were important to the King. For example King Afonso IV gave it to his wife as a wedding present, King Fernando bestowed it to his lover, and King Joao I gifted it to a heroic general. This historical town provides a great deal of cultural interest and also some of the region's finest cuisine. A great way to begin exploring it is by walking up to the Castle, which not only contains some interesting exhibits but is where you will get a wonderful view of the Tapada Real, or royal hunting grounds. Many a king would come to Vila Vicosa to hunt the wild boar and deer which were in abundance in days gone by. The Ducal Palace was formerly the residence of the Dukes of Braganza during the early 16th century. Its design was inspired by Italian Renaissance architecture and has a facade made entirely of marble. This region was so rich in the production of marble, many of the buildings and their features were built out of it. In fact even today, the town holds a famous International Marble Fair each year. There are 50 rooms open to the public in the palace, with private art collections of some of the best Portuguese artists of that period. There are also fine examples of frescoes, furniture, and armour from all around the world, and a library which houses a vast number of books dating back to the 15th century. The Palace square is 16,000 square metres of open space with several interesting sites to see. Before entering the square look out for the Porta do Nos (meaning Knot door) which used to be the original entrance. Visit the Real Capela which used to be the Bishop’s Palace and the Royal Chapel and gardens which are next to the square. Although a small town, it actually had seven convents. 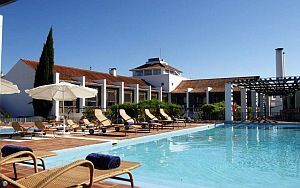 One of the convents, built in the 16th century, has now been converted into a luxury hotel, the Pousada Vila Vicosa (Hotel Dom Joao IV). Located on the Palace Square, it is not only very close to many of the main sights but also has its own restaurant and swimming pool. Many of the rooms themed as well such as the Hunters Room or the Musicians Suite. 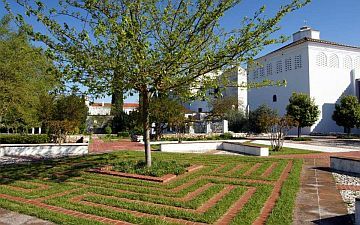 If you wish to explore the convents in Vila Vicosa be sure to seek out the 13th century Augustinian convent, Agostinhos, where the Dukes of Braganza were buried from the 16th century onwards. Directly opposite it is the Chagas Convent which has rather unique features that always attract the visitors. This is where the Dutchesses were buried, and inside is a very decorative tiled wall and several 16th century paintings. The most beautiful however is the Esperanca Convent which is covered in lovely frescoes and wall tiles. Not far from the Agostinhos Convent you will come to a very decorative pillory. It is considered to be one of the most beautiful in Portugal, and has therefore been declared a national monument. Vila Vicosa also has many churches of historical interest as well. The Senhora da Lapa Church has a very elegant Boroque facade, and the tiny church of Sao Joao Baptista has an unusual roof design influenced by the Moors style. The Church of Nossa Senhora da Conceicao is located inside the old town walls and was reconstructed after the great earthquake of 1755. It has been visited by Pope John Paul II and has a beautiful interior of blue and yellow wall tiles. There are also many treasures such as a precious 17th century tabernacle, the Holy Thorn from Christ's Crown, and valuable jewels which were donated to the treasury. For those who enjoy wandering around museums, Vila Vicosa is not short of those as well. To mention only a few, there is the Weaponry Museum with a fascinating display of unusual and rare pieces used by the Kings and Dukes over the centuries or visit the Palace Treasure to see an exhibit of precious artefacts which include jewellery, gold liturgical garments, artistic pottery, and much more. For something a bit different, the Coach Museum has no less than 73 examples of ancient transportation from coaches to sedan chairs. You will certainly not be short of things to see and do while you visit Vila Vicosa, and as it is surrounded by such natural beauty there are also plenty of opportunities to enjoy some scenic drives while you explore the fascinating region.